Agincourt600 – Commemorating 600 years since the Battle of Agincourt » How many French prisoners survived the massacre which took place at the battle of Agincourt? How many French prisoners survived the massacre which took place at the battle of Agincourt? The infamous massacre of the French prisoners ordered by Henry V towards the end of the battle is a well-known episode. Beside any ethical issue, the circumstances still leave many questions unanswered. What can be said is that many a prisoner survived the killing. Estimations of numbers in French and English chronicles range from no less than 700 to 2,200. However, if there is one lesson that students in medieval history know all too well, it is the need to question figures provided by chroniclers. Fortunately, surviving administrative and financial records in the English royal government records for the Agincourt campaign have survived in great quantity. They allow us to identify a number of French captives who survived the slaughter. Interestingly, they also give us an idea of the profile of these survivors. How many prisoners survived and who were they? The fate of the high-ranking prisoners is well documented in both chronicles and administrative records. Several French chronicles provide a list of prisoners. Those named in such sources, numbering fifty or so in total, were predominantly the higher-ranking nobles, knights and esquires. To find mention of lower ranking men, we need to draw on the English administrative records. We find 39 prisoners mentioned in the French (or Treaty) Rolls between November 1415 and the end of 1416 who can reasonably be linked to the battle of Agincourt. They are known thanks to safe-conducts granted by the crown, either to the prisoners themselves to return to France to collect money for their ransom, or to their associates to come to England with funds. Relatively few of these 39 appear in the chroniclers’ lists. We also know the names of 132 prisoners thanks to Exchequer documents which deal with the royal share of all ransoms. Indentures for service on the campaign obliged soldiers to pay a third of the value of any ransom to their captain, and a third of a third (i.e. a ninth) to the crown. Eighty obligations for payments to the crown of its share have survived. These were all sealed in Calais between November 1415 and June 1417 by English soldiers and citizens of Calais. These obligations fixed a date for payment of the royal share of the ransoms of these prisoners. If these debts to the crown had been paid off, the obligations would have been destroyed and we might never have heard of these prisoners. The fact that the debts remained outstanding twenty years after Agincourt has saved them from oblivion. In total, it is possible to compile from all sources a list of more than 300 prisoners. It is important to note that the evidence gathered from the different kinds of sources rarely overlap. This could be taken as a pointer to documents which had not survived, especially further obligations for payments to the crown. Even so, we are far distant from the lowest estimate in the chronicles of 700 prisoners. This reminds us again of the dangers of accepting numbers in chronicles. Interestingly, these 300 French prisoners did not all belong to the aristocracy. The supposed massacre seems to have been neither extensive nor selective. Surviving evidence distinguishes three categories of prisoners whose fate was determined by their relative wealth and status. 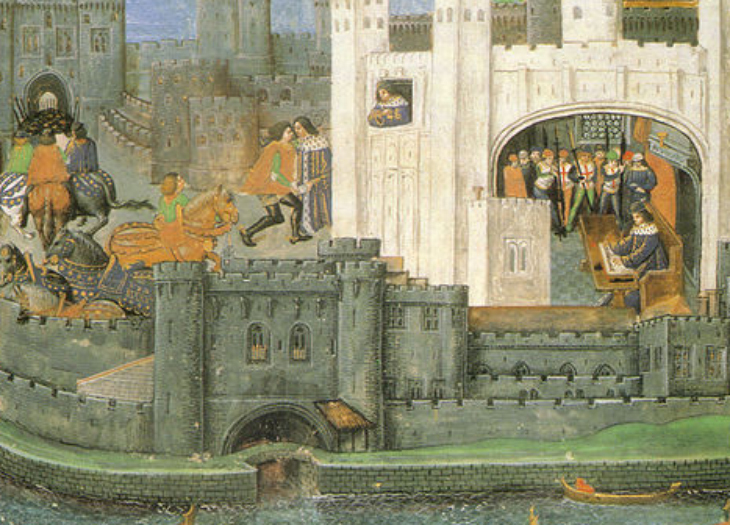 At the top of the hierarchy, there were the six prisoners of high public standing bought by Henry V and whose fate was linked to the political context. These are mentioned in virtually every chronicle: Charles, duke of Orléans (Charles VI’s nephew); Jean de Clermont, duke of Bourbon; Louis de Bourbon, count of Vendôme (both descendants of Louis IX); Charles of Artois, count of Eu (a descendant of Louis VIII); Arthur of Brittany, count of Richemont (brother of the duke of Brittany); and the marshal of France, Jean II le Meingre, called Boucicaut. Lower down the hierarchy, politics played a minor role. It was the prospect of immediate profit which dictated the fate of most prisoners although it is likely that Henry V also had some political interest in all prisoners who were taken to England. He had acquired a few of them himself, and in July 1416 he banned the departure of any French prisoner from England without his consent. Overall, however, most captives were put to ransom within a year or two of the battle. The majority, if not all, of the prisoners included in the 80 obligations were probably never brought to England at all. The presence of people of Calais among the masters (i.e. owners) of prisoners substantiates the comment of the Burgundian chroniclers Le Fèvre and Waurin that English soldiers and their French prisoners had been barred from entering Calais in 1415 out of fear that the town would run out of food. As a result, many of the soldiers sold both equipment and prisoners to the inhabitants of Calais town at a low price in order to have enough money to eat and to return home. This information came from Ambühl, R., Prisoners of War in the Hundred Years War: Ransom culture in the Late Middle Ages (Cambridge: CUP, 2013); Ambühl, R., ‘Le sort des prisonniers d’Azincourt (1415)’, Revue du Nord, 89 (2007), 755-88; Ambühl, R., ‘A fair share of the profits? The ransoms of Agincourt’, NMS, 50 (2006), 129-50. Where did Henry Cross the Somme?